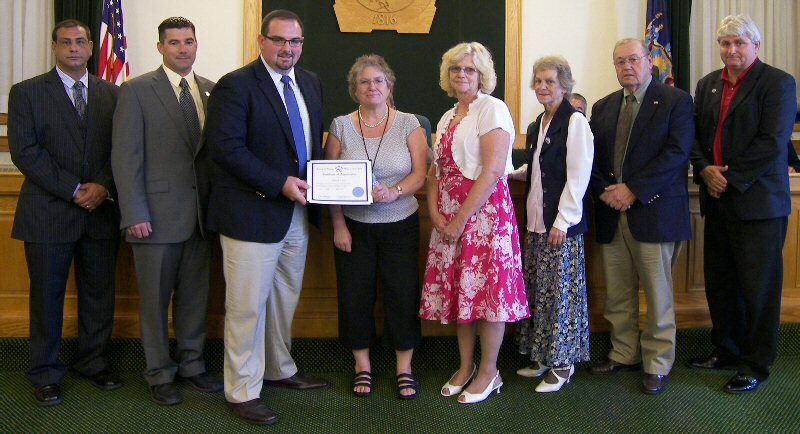 OSWEGO, NY – The Oswego County Legislature’s Community and Consumer Affairs Committee presents Deborah West with a certificate of appreciation for her 35 years of service. West is a senior tax map technician with Oswego County Real Property Tax Services. 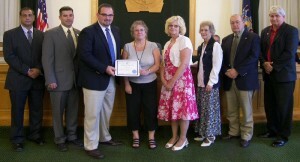 Pictured from left are legislators Committee Vice Chairman John Martino, District 6; Jacob Mulcahey, District 15; Committee Chairman Terry Wilbur, District 21; West; Debra Mullenax, director of Oswego County Real Property Tax Services; Mary Flett, District 17; Robert Hayes, Sr., District 10; and Daniel Chalifoux, District 19.